TRIVANDRUM, Kerala, India — Communist-led electoral coalitions registered substantial gains in two Indian states and several other regions this month in a development that observers say will have national repercussions. In Kerala, at India’s southern tip, the Left Democratic Front, led by the Communist Party of India (Marxist), wrested power back from the United Democratic Front (UDF), the centrist Congress Party-led coalition. The LDF won roughly two-thirds of the seats, 98 out of 140, in the provincial parliament. In West Bengal, in the country’s northeast region, the Left Front, a similar coalition, was returned to office for an unprecedented seventh term, winning three-fourths of the seats, 235 out of 293. The CPI(M) won over half of the seats by itself. “We had the people’s complete trust and we knew we would win by a huge margin,” Biman Bose, the West Bengal secretary of the CPI(M), told Reuters. The Left Front has won substantial support as a result of its improvements in the state’s water supply, literacy, health care and other social services. Its latest campaign platform emphasized the need to further reduce poverty. The struggles of common people, especially workers, helped the LDF win back power in Kerala. Voters were fed up with the misrule of the UDF government, whose neoliberal policies created adverse effects in several sectors of the economy. As a result of the UDF’s “liberalization” policies, growers of agricultural products like coffee, tea, cocoa and coconut are facing extreme hardship. Prices for these products have fallen to an all-time low, even as the UDF has allowed multinational companies to enter the agricultural sector. These policies have spelled ruin for many small farmers, and hundreds committed suicide in one small district in Kerala alone. During its five years in office, the UDF government in Kerala also undermined the public education system, shifting more and more schools into to a private, profit-oriented set-up charging tuition and fees. As a result, higher education became a dream for poor people. The effect of all these measures was to further undermine the hard-won social gains won by the people of Kerala over the course of many years of struggle. Communist parties and socialist groups led those struggles, and the election of the LDF candidates is widely seen as a vote of confidence in their ability to reverse the UDF’s course. V.S. Achuthanandan, a longtime leader of the CPI(M), will serve as the new chief minister of Kerala. The victory of the CPI(M)-led Left Front in West Bengal is remarkable for several reasons. No other political force in the nation has received the people’s mandate seven times in a row. The government’s bold moves to rein in privatization and liberalization, and its empowerment of the cooperative sector, have won it widespread support among the state’s working people. While there are many private multinationals operating in West Bengal, they are doing so under the strict and watchful eye of the government, which seeks to protect the public interest. 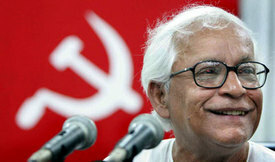 Buddhadeb Bhattacharjee will continue as the chief minister of West Bengal. In Kerala and West Bengal the right-wing, Hindu nationalist Bharatiya Janata Party (BJP) lost almost all of its races. The erosion of its support signals a growing rejection of narrow, communalist-oriented politics. “Overall these results have strengthened the role of the left in national politics,” said Prakash Karat, leader of the CPI(M), at a post-election news conference. M.K.N. Moorthy is the publisher of a progressive Malayalam language publication in Kerala, India.